Contributed by Subbiah Sundaram, VP Products, HYCU, Inc. It's that time of year again. Time to dust off the crystal ball, turn over the tea leaves and take a look at what 2019 has in store for IT companies. We were pretty proud of a few of our 2018 predictions, and know that many of them will continue to generate significant interest well into 2019 and beyond. For now though, let's take a look at what has our customers, and many technology users excited about this year. Continued Consolidation around Platforms and Eliminating Unnecessary Silos: It is no surprise that companies are looking to simplify their IT investments and take advantage of advances in reducing complexity. When you look at the next generation platforms in the industry today, the ones that come to mind are AWS, Azure and GCP in the Public Cloud space and Nutanix in the Enterprise Cloud space. While VMware is a great technology, their platform play seems to be around AWS. We would consider a solution a platform when it can handle all of the enterprise workloads. In the enterprise what we are seeing is that customers trying to consolidate on the platforms they choose and are eliminating the siloed infrastructure for secondary storage workloads. In 2019, we expect this trend to accelerate significantly. Using the Cloud for Burst Workloads and Adoption of as-a- Service Infrastructure Offerings: Infrastructure as a Service has been in use for many years now. For most people in the infrastructure space, they think in terms of instantly provisioning VMs, Storage and Networking as IaaS. While that is good, the bigger value will be realized when customers use higher level offerings like Database as a Service, Backup and Recovery as a Service, Data Warehouse as a Service, and Streaming Big Data Services. When utilized effectively, these would lead to tremendous savings and agility for the business. In 2019, we see customers not just doing a lift and shift to the cloud, but truly using the cloud for burst workloads and also utilizing these higher level services. A required dataset to make sure the solution is meaningful. In 2019, you will not just see a lot of buzz around AI, but the true value AI brings in solving customer problems that normal humans would have a hard time finding out about due to the sheer size of the data to digest and the associated complexity that comes with. Hybrid Cloud is Here, for True Workloads: When vendors and customers had to support both applications on prem and cloud, they immediately called it "Hybrid Cloud". But in reality the applications were in an either or situation and not a true Hybrid Cloud application. With the innovation that AWS has done with Outposts, Azure with Azure Stack and Nutanix with Xi, we are starting to see a truly hybrid infrastructure emerge that can allow applications to be elastic and spread across private and public clouds. Container Management has been integrated into the various platforms like AWS, Google, Azure and Nutanix. Customers are not just looking at lift and shift to the cloud, but also are looking at rethinking their next-generation applications. Any that you think we missed? Let us know, and feel free to leave a comment! 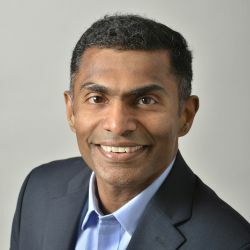 Subbiah Sundaram, VP Products, HYCU, Inc.
Subbiah joined HYCU in January 2017 and has been instrumental in enabling the company to deliver the best in class multi-cloud solutions for Nutanix and Google Cloud. Prior to joining HYCU, Subbiah held senior executive positions at BMC, CA, DataGravity, EMC, NetApp and Veritas and has extensive experience in product development, planning and strategy. He holds a MS in Computer Engineering from the University of Iowa and an MBA from the Kellogg School of Management at Northwestern University.